When she goes into her lunar phase one of three symbols will be activated and all of the runes of that symbol turn white, giving you a damage reduction buff. Once the phase is over, you need to run over all of the other runes of the two other symbols and none of the ones that had turned white and kill her before the next lunar phase. 1. Get the boss to Lunar phase. 2. Look at the Outer Circle runes, some will light up (white/Blueish) Those you will let be, the rest you run over. 3. Even after the lunar phase is over you can still run over all those who did not Light up (There will ALWAYS be 2 runes within the next rune that lid up) Example: OOXOOXOOX, Where X is the rune you do not touch, rest you run over. it should form a pattern all around with 2 spaces between each lid up rune. if it doesn't you messed up! 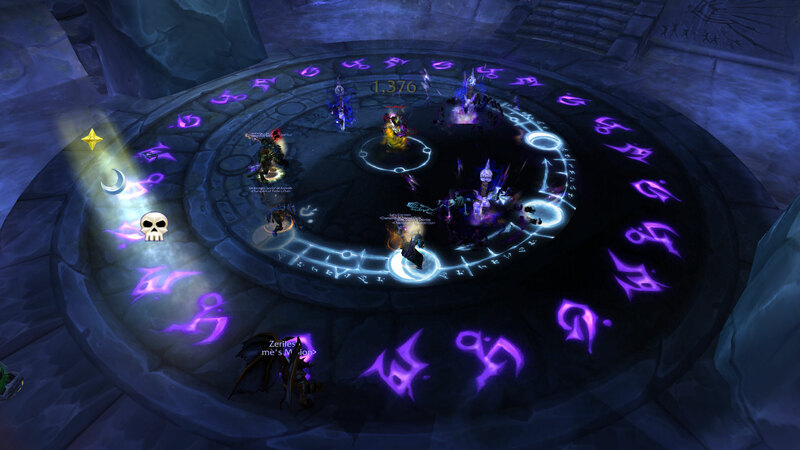 Looking at the boss before the pull, you will see about 24 small purple runes on the ground in a circle around her. There are three different symbols. My group called them: 1- "The Reaper", 2- "The Bat", and 3-"Undo Symbol". When the boss goes into her Dark Eclipse, she will light up one type of small purple runes (8 of the 24 runes) in a bright white color. The goal of this achievement is to "disable" the symbols that were not lit up in the lunar cycle (16 runes). You do this by stepping on the symbol. When deactivated it will lose its purple glow. The best time to deactivate the unnecessary runes is after a Dark Eclipse. You receive a helpful debuff (for standing on a white rune) called Lunar Purity. This decreases your magic damage taken by 80% for a few seconds. Ideally your whole group will get this buff, then coordinate deactivating the purple runes that were not lit up. Of note: Depending on your group's DPS, you may need to do this on the 2nd eclipse. If that is the case, just ignore the purple runes at first, then work on deactivating them after the 2nd Dark Eclipse. okey short explenation of this achi. When she use that Dark Eclipse spell you have to pick up bright (white) rune from inner (middle, smaller...) circle and then step on shadow runes in outer (bigger) ring. You need to AVOID stepping on bright runes in outer (bigger) circle. There is simple order of outer runes - 1 bright, 2 shadow, 1 bright, 2 shadow... So you just have to be sure there is 1 "active" rune and 2 disabled. We popped BL on pull and we did this w/ avg. 10k DPS w/ only 1 Dark Eclipse. Also don't forget about adds! 1. Fight as usual for first Dark Eclipse. Bring her to low health, wait for second Dark Eclipse. 2. When second Dark Eclipse goes off, grab buff by standing on the INNER ring's white moon runes on the ground. Note which 8 of the 24 symbols around the room turn white momentarily. All 8 will be the same type - ear, bat, or reaper, and you'll note the white runes are all two runes apart. 3. The 8 white outer runes turn back to purple. Run over all 16 of the other two types of runes that didn't light up. Do not touch the runes that were white. Paladin bubble helps. 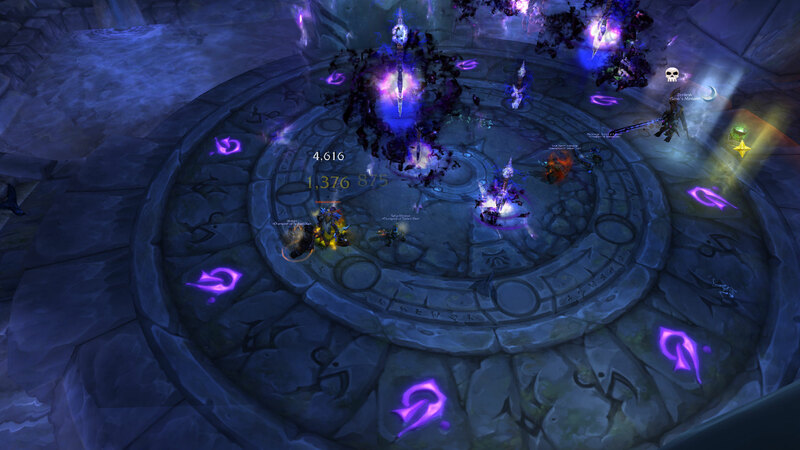 Once those 8 runes are the only ones left (they are purple now), kill the boss. TLDR: Floor should look like this when she dies. 8 runes, all the same type that lit up white during the dark eclipse. This last photo from a separate pull so the white runes were different from previous two photos. Credit to Zillions, thought photos would help. I think all the comments complicate this achievement a bit too much. Before starting the fight, there are 24 purple runes around the circle-shaped boss platform. The boss casts Sombre éclipse. As you may notice, every third rune of those 24 purple runes turns white for a short amount of time (don't walk on these runes, walk on every other, this is what the achievement is all about!). Your goal is now to eliminate all the purple runes by walking over them and ignoring the runes that turned white for some seconds. Place four world marks dividing the circle into four quarters and assign every player except the healer to run one quarter of the circle (6 runes). You should find an entrance point to the circle by watching a white rune. Then you know, that the following two runes are purple, the next one is white, then two purples again and so on. Walking over the runes causes some damage. Use personal cooldowns and don't let your healer do the rune walking. You can also use the white runes in the smaller circle in the middle of the room to get damage reduction. 1. Dont remove purple runes. 2. Boss casts Sombre éclipse. Some runes turn white. They'll turn purple again. 3. Walk over every purple rune that has not been white. During eclipse, the boss lights up some runes white. 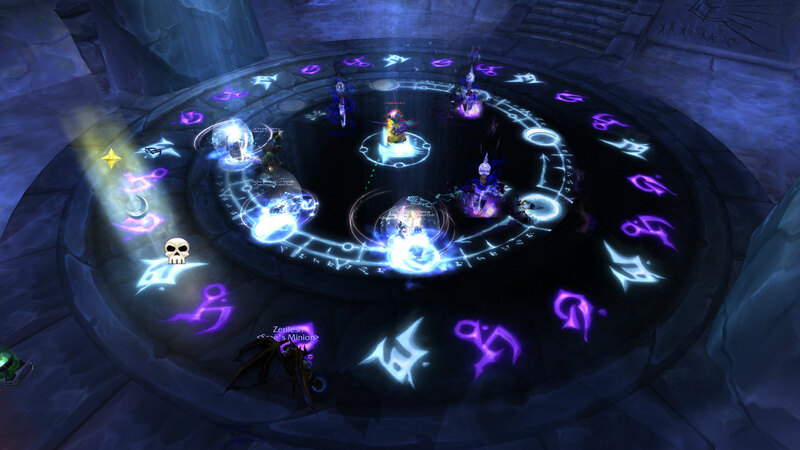 Get the moon debuff from the inner ring and step on all of the runes in the outer ring but those that had lit up white. Soloable with monk tank ilvl 717. 3. Kill add which is dragging to boss everytime. 4. in eclipse phase 1 type of runes will go white for short time, remeber whic hrune it is, after its go purple again just step on all other runes. Its still 2 runes step, 1 not. EDIT: Out-Of-Date with the new legion patch. I recommend taking the Hand of the Protector talent to have a lowered self heal cool-down. Haven't tested this. Purified shard of the third moon will also help! Jump down, don't kill spider. Kill trash patroling just outside. Single target no aoe. Repeat this until she has about 10% health, then take not of the white runes. As of Legion, the rune(as well as Boss) can hardly hurt you or even hit you. Simply step on those in question. I tried so many different ways of doing this solo (waiting for second eclipse phase etc.) After probably 6 kills this is what finally worked. Since Legion it is easy; you can solo it. There a pattern; 1 rune will turn white, the next 2 will NOT. One will turn again and the next 2 NOT. So, you watch them, check one and just run clockwise (or counter-clockwise) step on 2, skip the next step on 2, skip the next, step on the next 2 until you get back to the starting point. To earn this achievement you have to visit Terres sacrées d’Ombrelune instance and find there Sadana Rougefurie boss. To earn the achievement you have to ruin all runes except ones, which lighted by white color when eclipse casted. There are the order: one white rune, then two purple, so there are 8 white runes and 16 purple, which you have to ruin running over them. I did this achievement as a level 110 paladin and can now easily be solo'd on Heroic mode. As of Patch 7.2: Tomb of Sargeras, this achievement seems to be bugged. Two friends and I tried this achievement four times, and we tried strategies listed here and in YouTube videos; nothing worked. We've opened a ticket with Blizzard, we'll see what happens. It would appear that this is the only achievement that is currently bugged out of the 23 achievements in the meta. Legion update: With 110 feral auto-attack off using all gear, brought boss to roughly 50% health, then very very gently down lower. Once she cast her spell to darken outer circle and light up middle circle, followed posts above to stand on a lit moon in the middle circle, noting a lit place in the outer circle. Then ran on "every other one" on the outer circle, thus avoiding the previously lit ones. When outer circle complete, nuked boss. Worked perfectly. Achievement rang with no problems when boss died. Hats off to Garlin and NcJackson for their great posts. Wait till one rune lights up white, mark what that rune is. When all the runes go purple, go step on every other rune except the ones that were lit (white). I guess nobody mentions this because nobody has a crappy computer like mine, but if your to slow and she casts Dark Eclipse again it resets everything. 2. Get rid of your pet, you don't need that thing running around causing trouble or distraction. 4. Boss will cast Dark Eclipse. 5. Make sure your screen is zoomed out all the way, and take note of a single white rune that lights up along the perimeter, many will light up so choose one, and it doesn't matter which one. 6. You will notice that the purple runes are 2 for every 1 white rune. So, run over the 2 purple runes BETWEEN each white rune. Start at the purple rune beside the white rune you took note of. 7. Do not run over ANY white runes. 8. Once you complete the entire circle, you will end up perfectly beside the white rune you took note of at the beginning. Only white runes remain. If not, wait for boss to cast Dark Eclipse again and try again--Rinse and repeat the above. As of 8.0.1 I can confirm is does NOT work on Mythic. Accidentally killed her in a one shot and got the achieve without doing any phases. Vaincre Sadana Rougefurie alors que seules les runes correspondant à son cycle lunaire actif sont allumées dans les terres sacrées d’Ombrelune en mode héroïque.